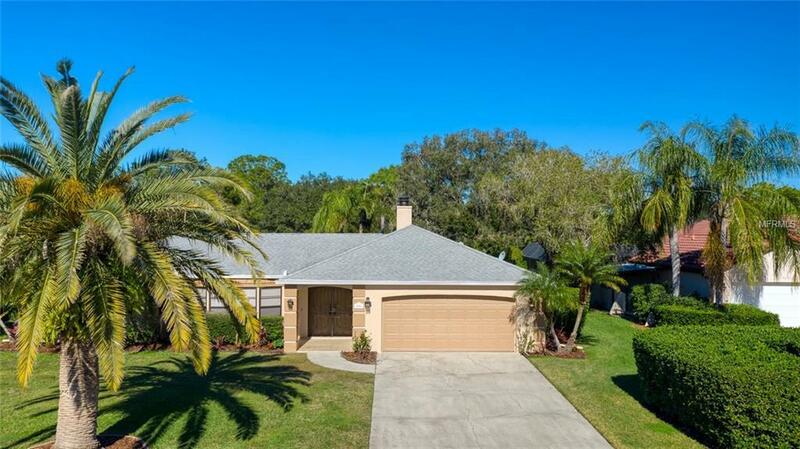 This home is a must see and offers wonderful amenities and amazing views in a spectacular location for peaceful living and convenient access to the ever busier Sarasota area. The Meadows is an exclusive sought-after community in a unique and immaculately maintained 1650 acre environment of homes, recreation amenities, lakes, and nature preserves. The community is ideally located close to the Downtown Bayfront and Arts district and I-75 / UTC Shopping Center complex, and is actively patrolled each day by security and maintenance staff. Greywood Lane is a very quiet cul-de-sac street with larger more exclusive lots on serene lake, meadow and golf views. Mature palms and landscaping circle the entire home. The 3 bed - 2 bath split floor plan is ideal for hosting guests or entertaining. A smart floorplan, large rooms, and plentiful storage ensure comfortable living. Sliding window walls open up to the screened lanai and pool so you can enjoy open breezy living. The kitchen is the heart of the home and offers wonderful views and ideal access for dining and entertaining inside and poolside. The southwest facing screened lanai and pool includes 500 sq. ft of covered patio ideal for relaxing, entertaining, or pool fun. The huge rear yard with privacy hedge, mature oaks, and lake shoreline overlooks the adjoining nature preserve. The $853 annual HOA fee is very reasonable for a homesite of this scale, and lower taxes and fees are another plus because The Meadows is not in the City of Sarasota. Listing provided courtesy of Atlantis Realty Group Swfl.